Today we updated REC.VC with a new security feature enabling you to set the Link Lifetime when sharing your recorded videos with third-parties. You can with the new sharing feature create unlimited numbers of playback links for a video with unique Link Lifetime (e.g. for different audiences). 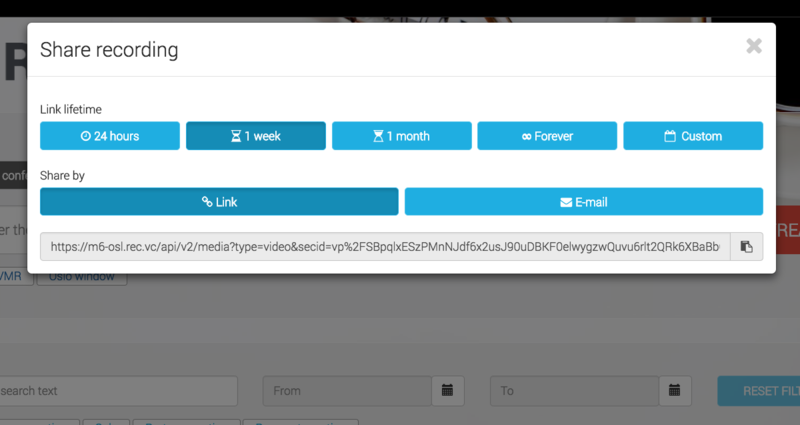 When creating a new playback link you can easily copy & paste it from the user interface, or share it by email (triggering an email from REC.VC). Any playback link that you have shared prior to February 1st, 2018, will continue to work for at least two months. We recommend however that you by April 1st 2018 generate and share new links for any of your old recordings that you want external parties to have access to. We do not guarantee that old playback links will work after April 1st 2018.